I grew up with a fairly traditional meat and three veg meal which was often plated up individually in the kitchen by my mum. This rice bowl served with some kind protein and vegetable sides has long been my version of the traditional meat and three veg meal. Unlike my mum, I almost never plate up the meals and instead, place the rice and platters of bowls of food on the table for people to serve themselves. This does add to washing up but I prefer this way of eating meals… in actual fact, I can’t stand having food served up for me as I always end up with too much rice or not enough rice or not enough pumpkin and greens. It just annoys me. As a cook, I hate plating up single plates of food for everyone because I’m faced with a similar dilemma – how much rice do I give that person, how much greens, do they hate pumpkin and so on: it’s just exhausting. Serving food on platters in the middle of the table gives a sense of occasion to the simplest of family meals and people can serve themselves and exactly how much and what they really want to eat. But back to rice bowls – occasionally, I’ll get all nostalgic for the traditional style of food my childhood and I’ll make a vegetarian version of meat and three veg and I’m always amazed by how exhausting I find that style of cooking with a main dish and some vegetable sides. Then, if I want go the ‘full monty’ on tradition and plate it up, I’m just knackered by the end of it all. That’s thing about rice bowls – if you’re familiar with the dishes. they’re pretty easy to organise (but if you’re not familiar with the dishes, that’s an entirely different story). 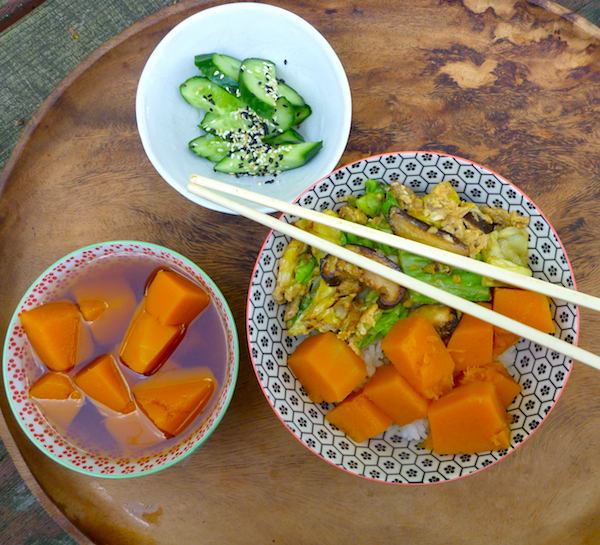 This simple pumpkin cooked in soy sauce was a side dish for rice that I used to make a lot years ago. It’s from one of my first cookbook bibles: Madhur Jaffrey’s Eastern Vegetarian Cooking (my copy is now stained and falling apart). When I decided to make this pumpkin dish to post, I went back to the cookbook and actually followed the recipe for a dish that I used to make countless times by heart. Strange to say, but I don’t think I’ve ever really followed the original recipe! It uses a quite scary amount of sugar so that when the pumpkin stock is reduced, it is quite sweet and almost syrup like. It was, in fact, too sweet for me in its original form so I’ve changed the recipe back to how I have always actually cooked. It’s a much less sweet version. 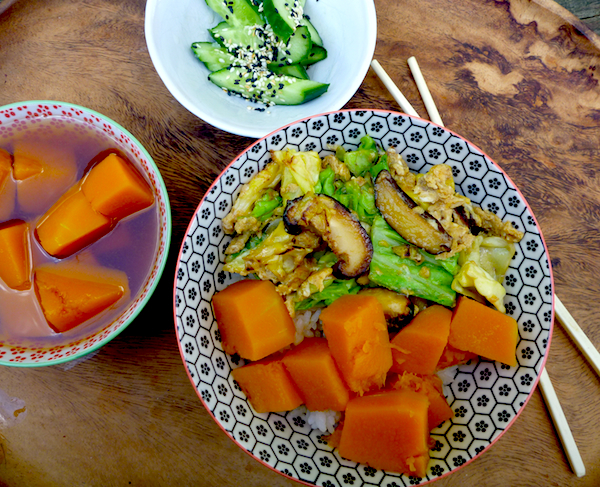 The scrambled eggs with cabbage is another simple Japanese dish from Madhur Jaffrey and I’m posting it because the pumpkin dish seems a bit too odd to post on its own – one does need some protein in a rice bowl. I love this rustic and simple combination of shitake mushrooms, cabbage and eggs, which you could serve on its own for a simple meal. 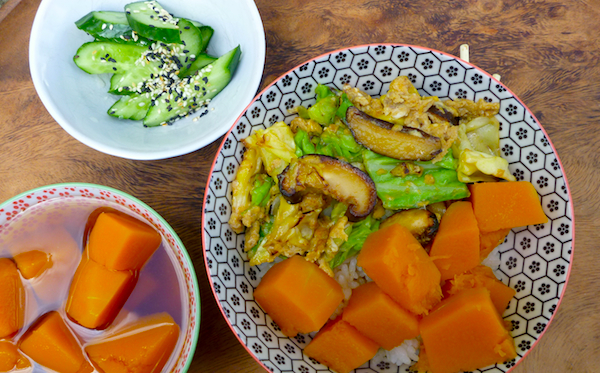 Spring is in the air in Sydney and this rice bowl is a celebration of the last of winter. I served this with white sushi rice because I was in a rush but it would be extra nutritious and delicious served with brown rice. You can make this eggs in a non-stick frying pan but I use my well seasoned Karhi wok. 115 grams of cabbage leaves cut into 1/2 inch or 11/2 cm squares ( about a couple of handfuls of cabbage). If you are using dried shitake mushrooms, soak them in hot water for half an hour, drain, decap and cut into thick slices. If you using fresh mushrooms, cut out the caps and cut into thick slices. Beat eggs lightly, season with a pinch of salt, a pinch of sugar, soy sauce and mirin. Heat oil in a 20 cm non-stick frying pan over a medium flame. When hot, saute mushrooms for about 30 seconds, then add cabbage and saute for about 2 minutes until cabbage is wilted but still slightly crunchy. Season with another pinch of salt, then add eggs and stir them around to scramble them. They are best if kept slightly on the soft side. Remove from frying pan as soon as eggs are done and serve with rice. Peel pumpkin and cut into 2 cm cubes. Place in a saucepan cover generously with water add sugar and bring to a boil. Cover lower heat and simmer for about 5 minutes until pumpkin is just tender. Remove pumpkin from pan with slotted spoon, then cook down the liquid stock until reduced by about half. Add soy sauce and salt. Put pumpkin back into pot and simmer uncovered for about 1 minute. Turn off and allow to cool in pan. Reheat before serving.